US Congressmen Engel and Nadler were attacked by Arab rock throwers Friday afternoon on the Mount of Olives. United States Democratic Congressmen Elliot Engel and Executive Vice Chairman of the Conference of Presidents Malcolm Hoenlein were attacked by Arab rock throwers on Friday afternoon as they visited the Jewish cemetery on the Mount of Olives. 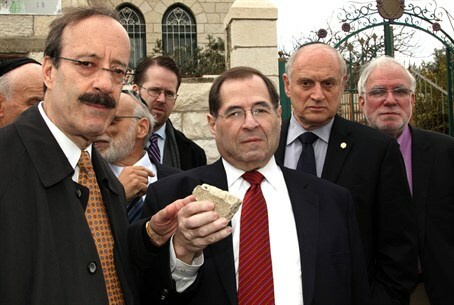 A large “baseball-sized” rock was thrown at the group, and just missed hitting Congressman Nadler. Both he and Rep. Engel are from New York. They spoke Saturday night at the International Committee for the Preservation of Har Hazeitim's Emergency Forum on Violence at Mt. of Olives Ancient Jewish Cemetery. “He’s fine. No one was hurt. I think they were waiting for their bus, and then a rock was thrown… and then Israeli police officers chased the person away. They didn’t catch them. Then they got on the bus and left,” said Nadler’s spokesman, John Doty. Engel issued a statement confirming the report. “As we were about to board the bus at the conclusion of our visit, I heard a rock hit a car about 100 feet from us. I saw police jump out of their vehicle to ensure our safety. I don’t know if the rocks were thrown at us or at the police. All I know is that we heard a thud and later someone brought over the rock. We were told that the incidents happen like this all the time, but it is disconcerting to actually be a part of it,” he said. “This incident is just more evidence that the vandalism of the graves, and the harassment of those who visit the cemetery need to be stopped,” Engel continued. There have been many cases of vandalism against the Jewish cemetery on the Mount of Olives. After a rock attack in late November, an Arab perpetrator was found guilty on the basis of video evidence that showed him vandalizing the ceremony, and he was sentenced to three months in prison for his crime. A meeting was called for Saturday night in Jerusalem, including members of Knesset, Deputy Foreign Minister Danny Ayalon and Hoenlein, to address the recent acts of Mount of Olives desecration. “Though it is unknown who was behind the rock-throwing or who paid the November vandal caught on tape, Palestinians and their supporters frequently deny the Jewish connection to Jerusalem and other locations in Israel. Examples include rebranding Jewish holy sites as Muslim, denying the Jewish Temple ever existed in Jerusalem, and identifying Jesus as a Palestinian. Erasing the Jewish connection to the Mount of Olives can only serve the political efforts to bolster the Palestinian claim to the Jerusalem, while challenging Israel’s,” stated The Blaze. Charley J. Levine, adviser to the Preservation Committee in Israel stated, "This is not a freak occurrence. This sort of vicious vandalism and desecration occurs at Har Hazeitim [Mount of Olives] every single day, some orchestrated and some spontaneous. It is a shame of enormous proportion that this takes place at the oldest and largest Jewish cemetery in the entire world,” he told Arutz Sheva.